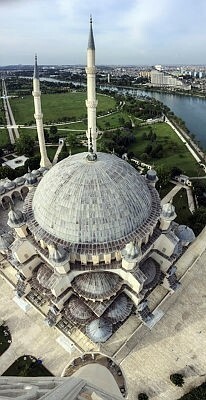 Lying in the heart of Çukurova, a geo-cultural region alternatively known as Cilicia, Adana has many historical places. About a thousand years ago, give or take, some wealthy landowners in central and western Europe got the idea into their heads they should travel across the entire continent to retake the Holy Land in the name of Christendom. The local religious authorities thought this a brilliant proposal and instituted a clever system of incentives to raise money and find recruits, namely, shaking down funds with the promise of rewards in the afterlife. Nobles and their retinues signed up with visions of glory. A ragtag army composed of people from the many kingdoms of Europe shambled from the seat of the Byzantine Empire in Constantinople down into southeastern Anatolia, making for the city of Antioch, and eventually, they hoped, Jerusalem. Spoiler alert: It didn't go all that well. Over the next two centuries, the Latin Church called for something like eight more (depending on how you tally it) of these "crusades," and each time, the traveling armies left their impression on the landscape. That isn't the only reason this curious strip of fertile coastline caught my interest. Çukurova - meaning something like "the low plain" - also has hosted several different populations. Like most places in this ancient country, they have had their fair share of Hittite, Persian, Greek and Roman influences. This stretch of the southeast, however, had more of an Arabic touch. Hatay province, for instance, just out from the Anatolian mainland as a finger of the territory into the Levant, and it was an independent republic after the fall of the Ottoman Empire. It only voted to join the Turkish Republic after many of the population exchanges had taken place, so it kept a good deal of its Greek, Armenian, and Arabic populations. My downstairs neighbors in the last house I lived in were from Hatay, and although they were Turkish, their first language was Arabic.In this article, we will be following the path of the Crusaders in a far more prosaic way - heavy on the sightseeing, lighter on the pillaging. One of the reasons the Romans dominated the ancient world was because they conscripted the local populace and their own armies into making roads. It's not like the army themselves used all that many mounted warriors - but it certainly makes walking easier if you are going along flat, stone-paved ground than bushwhacking through Mediterranean brambles. In the Tarsus city center, an attendant will charge you a few Turkish liras to view the basalt road. If your itch hasn't been quelled, you can take a dolmuş up to the village of Saglikli, where there is another 3 kilometers of unearthed road for you to walk along. Other fun sites are Cleopatra's gate in the center of an unremarkable traffic roundabout. This is where the Egyptian Roman queen entered the city of Tarsus to meet with her secret lover, Marc Antony. While you're hanging around Tarsus, you might as well visit the beautiful stone covered market, the Kirkkasik Bedesten - the 40-spoon bazaar, so-called because the lotus carvings looked a lot like spoons. No doubt the crusaders bought their own share of souvenirs here before slogging the rest of the way to the holy land. The first crusaders here encountered the occupying Seljuks, who had only snatched it from Byzantine hands 20 years prior. Crusaders, of course, failed to hang onto it for very long – an Armenian Kingdom occupied much of the territory nearby until the Ottomans claimed it in the 1500s. Adana got a huge boost in the mid-1800s, oddly enough, because of America's civil war. America's cotton industry had been dominant in the world, but it got dealt a harsh blow when war about whether slavery was OK or not brought factories and plantations to a standstill. Adana's entrepreneurs saw an opening and began growing cotton at a fantastic rate in Çukurova's fertile soil. It attracted a host of European investors, which created a market for a decent nightlife with some decent singers. Adana will always be my favorite town because someone got so hot and angry at the sun, pulled out a gun, and shot at it. There are lots to appreciate in terms of sightseeing. The Taskopru, or stone bridge, was built by the Romans. (Turkish has a wonderfully literal instinct for naming things, don't you think?) There has been many bridges over the river Seyhan as long as there have been occupants on either bank, but this Roman-engineered construction of stone has been around longer than any other. 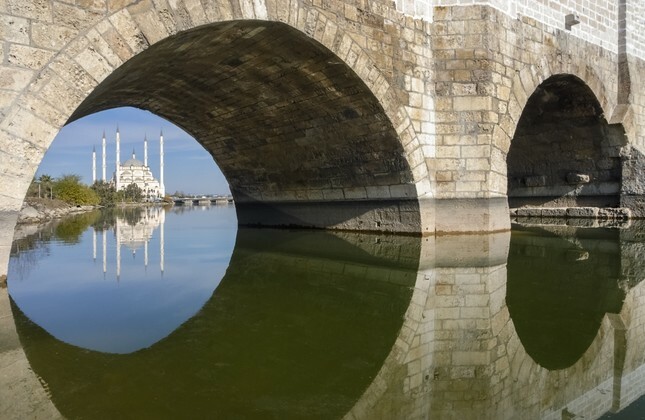 It would have been an architectural marvel when it was completed in its day: 21 arches across an almost 300-meter waterway to allow armies and caravans to cross unhindered. Next, we have our paragraph of mosque history. The Ulu Mosque and the kulliye complex has an unusual style – the minaret looks more like a lighthouse in the middle of a city than anything else, and the patterns of Mamluk design involve a lot of parallel hypnotic mosaic stripes. If you stare too long at the front gate, you'll swear the stripes are flickering up and down, like an optical illusion. Inside, the Ulu Mosque got an Ottoman upgrade of blue Iznik tiles, imported all the way from the Marmara coastline. Of course, the whole thing had to have an upgrade since it fell down in an earthquake in the 90s, but the restoration has been tasteful. The Ulu Mosque was the largest mosque in the city until the stupendously wealthy Sabanci family built the gargantuan Sabanci Merkez Mosque in 1998 in the old Ottoman style. Towering over the old town in Adana is a 19th-century clock tower designed by two Armenian architects. Its name? The Büyük Saat, or "the big clock." It is a historic tower, built as a forward-looking modern monument, nearby a Roman bridge and a bustling industrial city. It stands as one of those curious reminders that Turkey is both modern and ancient simultaneously. Foodwise, Adana has of course given its namesake to the spicy kebab served everywhere in the country and beyond. So instead of talking about a known object, we are going to examine briefly some unknowns. Sirdan, for instance. Sirdan's made from the innards of a cow or sheep, stuffed with rice and onions, sewed up, and then boiled in a reddish ooze. When it comes out, it looks like a pale alien polyp served in grease. I know it sounds terrifying, but it's the glorious hit of animal products that your body has been craving. Alongside it, make sure to get a nice cold glass of Salgam, spicy beet pickle juice. Here's our last stop in Turkey – the historic city of Antioch, where many a crusader met their bitter end. Though the Crusaders defeated three relief armies, and eventually took the city for themselves, they did so at a heavy cost – one in seven of them was starving to death by the end of the prolonged six-month engagement, and plenty had deserted. They managed to hang onto the city for another 150 years before it was retaken by an Islamic army. The real gem of Antakya is its old town. Step into it, and suddenly it is a maze of antique wooden doorways amidst low cobblestone houses and streets, with palm trees interspersed throughout. Locals enjoy meze in every courtyard when the weather is pleasant, which is most of the time. And Kunefe. Kunefe is a glorious dessert creation of the Hatay province, made from fried vermicelli noodles, sugar syrup, cheese, cream and pistachios. It is a crispy sugary concoction with melted sweet cheese on the underside, and I would eat it every day of my life if I knew it wouldn't make me fat. Pay the last visit to the church of St. Peter before you leave the city. It is one of the crusader's nicest leftovers, and it suits the architecture of the city – yet another cobblestone courtyard, but this time with a few frescoes of Christian imagery.